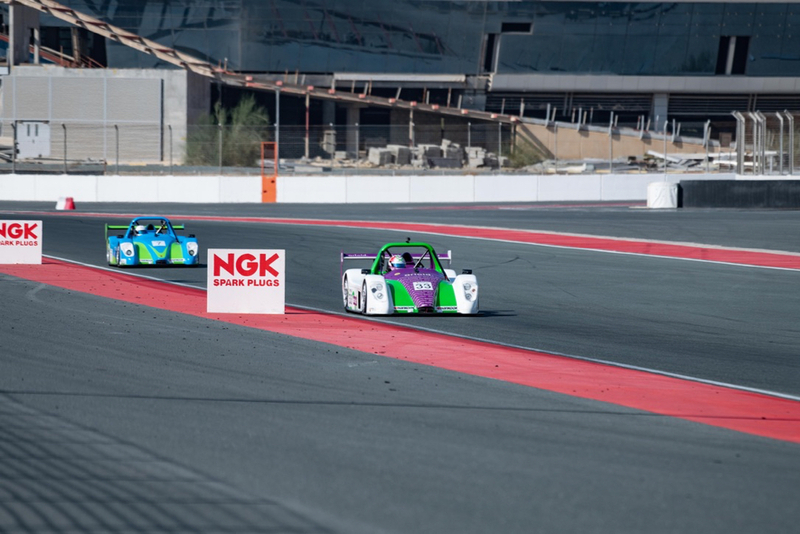 As the 2018/19 Gulf Radical Cup draws to a close the top three spots were still very much up for grabs! Testing took place in good conditions on the Thursday with Finnish pairing of Jani Hjerppi and Seppo Mantyla setting the pace with a 1.26.384 and then James Edmeades setting the pace with1.25’s on Friday morning on a faster track. Ian Roberts and Sergey Shalunov also posted times in the 1.25’s and 1.26’s so it was shaping up to be a competitive weekend. As the teams and drivers woke for race day they were greeted with rain! However the circuit seemed to have been spared the worst of it and the track was dry for Q1. Jani Hjerppe took the Pole with a 1.25.111. Just 0.09 behind him was Sergey Shalunov, and third Sean Simpson. With only a five minute gap it was straight back out for Q2, this time Shalunov had a point to prove by setting the exact same blistering time within a thousandth of a second of his Q1 lap a great demonstration of consistency. So Hjerppe lined up with Shalunov next to him as they raced off into turn one in a cloud of dust. Hjerppe managed to retain his lead with Shalunov and Simpson right behind him. Having missed the previous event Hjerpee went into this race with no pit penalty, while Shalunov having won the last race had the maximum 15 seconds. Roberts was in 4th right up the exhaust of Simpson, finding it tricky to get passed, so Roberts pitted as soon as the pitstop window opened. Simpson had a slow pitstop allowing Roberts past. After all the pitstops were complete and the timesheets settled, it was Mantyla leading from Roberts, Shalanov and James Edmeades had moved up to 4th. With a 16 second gap between the two lead cars it looked like it was going to come down to the wire with Roberts taking 1 to 2 seconds a lap out of the leader. However just 5 laps from the end of the race Mantyla made a mistake allowing Roberts and Shalunov to get within 0.5 of a second. Roberts applied all the pressure that he could to get past, and when entering the club link Mantyla braked too late running wide, also allowing Shalunov past. In the mean time D5’s Edmeades had joined the party and he was desperate to deny the Finnish pairing the last step on the podium. Just on the last lap the D5 car got great drive out of turn 8, forcing through on the inside of turn 9. But it was GulfSport Racing’s two drivers Roberts and Shalunov having faultless drives to take a great first and second. 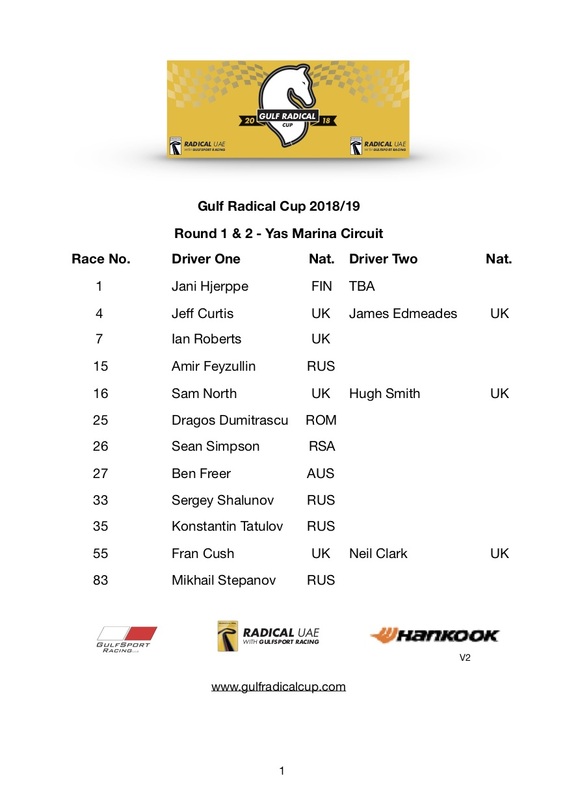 With double points for the last two rounds of the Gulf Radical Cup, all Jani Hjerppe needed to do was finish 5th to claim the title, but it was still wide open for 2nd and 3rd. Starting on Pole for race 2 was Shalunov, however the sun was really not shining on him and when the team came to start his car before the race, nothing! This left the team franticly try to get it started. Motorsport can be cruel and this was cruelty at its best, given that it had run faultlessly only a few hours before. So with the top spot of the grid empty it allowed D5’s James Edmeades to take the lead. A few laps in and as Ian Roberts tried to pass the North Racing car driven by Hugh Smith they went side by side in to the club link, with Smith remaining in front. But into turn 16 Roberts took his chance from a fair way back, unfortunately clipping the back of the North Racing car sending them both in to a spin. The North Racing car coming to a permanent rest on the edge of the track, so the safety car had to be deployed. The packed bunched up depriving Edmeades of the lead he had built up! Under the Safety Car for only two laps, racing started once again. Edmeades kept his lead and was keen to build it back up as much as he could going into the pit stops. Meanwhile Ian Roberts was being served a drive-through penalty for his contact with the North Racing car earlier in the race, but unbelievably he had a buddy serving it with him by the name of Jani Hjerppe, having confused Ian's race number of 7 for his number of 17. Needless to say, there were dropped jaws a plenty in the pitlane as both cars cruised passed the teams! Jeff Curtis had taken over the D5 car in a quick pit stop, but on lap 19 he did not emerge. He had stopped out the back with a transmission issue. This handed the lead to Simpson who had been keeping out of trouble and was putting in fast and consistent laps. Roberts was now charging from the back eventually getting back to 3rd place, but it was Simpson taking the honours with a fantastic win. So after the points had been calculated it was Hjerppe being crowned as the 2018/19 Gulf Radical Cup Champion and being awarded a fully funded race weekend at Silverstone in August with the Radical Factory Team. Vice Champion was Ian Roberts who will be off to Valencia for a fully funded test with Virage Racing in their Ligier LMP3 car. However Simpson and Curtis/Edmeades were drawn for 3rd each with 168 points. As per the series regulations for a tie it’s all down to series wins, but both with 1 win each, its down to fastest laps - and that goes to the pairing of Curtis and Edmeades. So amazing prizes, great venues and a great season of racing with 22 amateur drivers scoring points in the country's longest running sportscar championship. The two most successful drivers/driver pairings of the UAE’s 2018/19 Gulf Radical Cup, a one-make sportscar championship for ‘gentlemen drivers’ which completes on the 22nd March will be awarded amazing fully funded drives. Dubai based GulfSport Racing, who started the Gulf Radical Cup in 2006 is the official representative of Radical Sportscars Ltd, now the world’s largest sports racing car manufacturer. The Radical SR8LM set the Nurburgring track record in 2009 at an astonishing 6 minutes and 48 seconds in the hands of Michael Vergers, who drove the car to Germany from the factory in Peterborough! Its still tight at the top of the points table, even with Jani Hjerppi healthy lead of 45 points (after using the drop score allowance), there are still a potential 106 points available going into the last round, given that it's double points for both races. 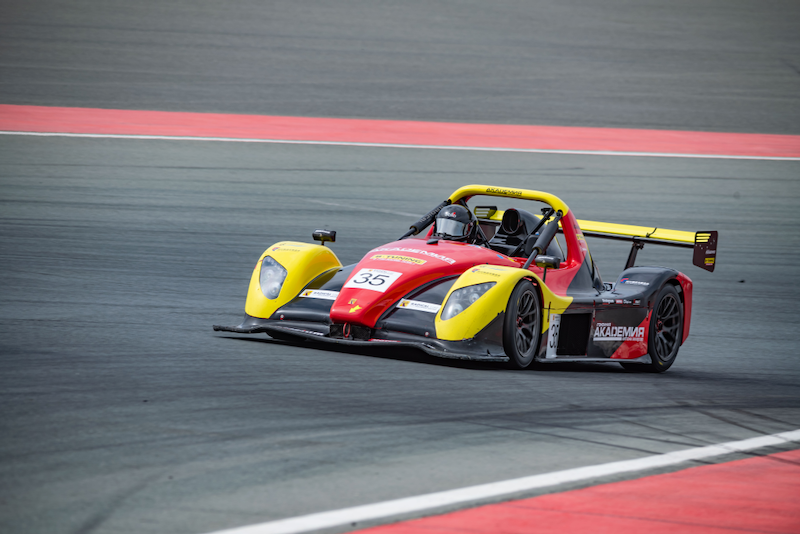 Radical Sportscars has offered a fully funded factory drive at the biggest race weekend of the year at Silverstone on the 17/18th August - one of the world’s most iconic race circuits, where a Dubai based driver will get to compete on level terms with the UK’s best racers. This award will go to the 2018/19 Gulf Radical Cup Champion. 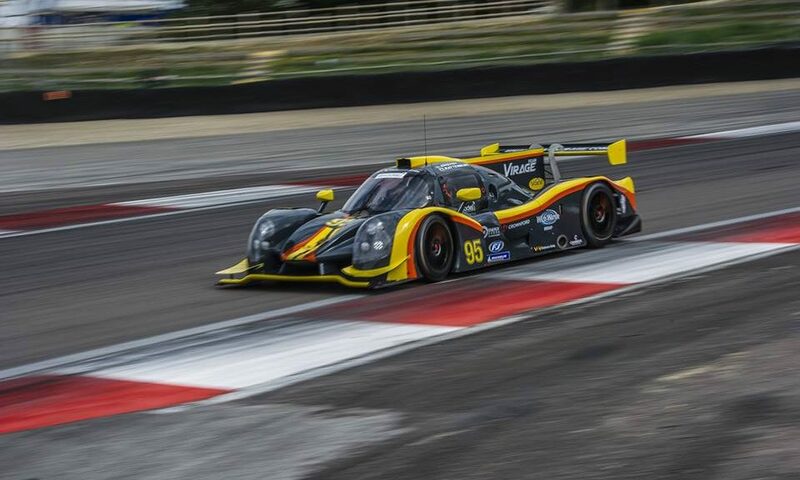 Valencia based Team Virage, one of the front runners in various European GT and Sportscar Racing championships has offered a fully funded sim training and test day in an Le Mans Prototype LMP3 (5 litre V8 420bhp Ligier JSP3) - the next step to the World Endurance Championship and Le Mans for the ambitious Radical racer. This award will go to the Vice Champion of the Gulf Radical Cup. 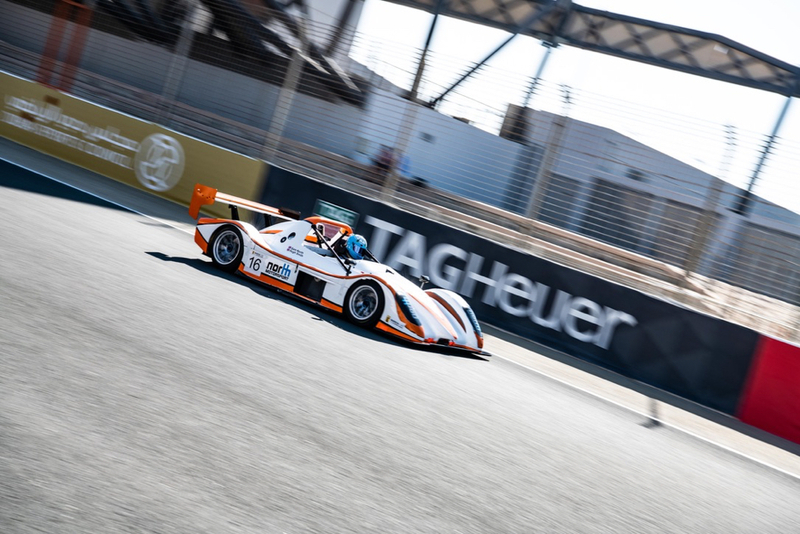 Going into the penultimate round of the Gulf Radical Cup, series leader Jani Hjerppe was not in attendance, this gave a great chance for those hot on his heals to edge closer. However, bad luck and weather had its own ideas! Sergey Shalunov showed his pace in free practice on the Thursday, but as the field rolled out to Q1 his car had developed a gremlin overnight, with the team spending next 30 mins frantically trying to resolve the issue Sergey was unable to post a time. However the flying Ian Roberts snuck in an impressive 1.27.119 in the tough damp and dusty conditions to take pole. For Q2, the rain came down, and with a few delays and stoppages the session finished with Ben Freer posting a pole time of 1.43.213. For all it was just a question of survival being out on a wet track on slicks. But all cars returned home safely! In the meantime it was looking like Shalunov car was fixed and he would start Race 1 from the back of the grid. So, Ian Roberts started the race on pole but it was Hugh Smith got a great start to lead away. Unbelievably Shalunov’s issues had not gone away with him pulling in on lap one. Ben Freer ran off track on the first lap with Jeff Curtis and Sean Simpson taking advantage and slipping past. After numerous attempts to get passed, Simpson spun off shorty after making a great overtaking move on the quick Curtis, losing Simpson some 20 seconds. With a stall in the pit stop for Sam North, they lost some 30 seconds struggling to restart, handing the lead to Roberts. This left James Edmeades chasing down Roberts right to the finish line. But Roberts was comfortable and was able to maintain a gap to take the chequered flag! Ben Freer also had a comfortable and controlled race after his time off track in the first few corners of the opening lap, Simpson fought back after the pitstop and managed to overtake Sam North and finish 4th. The following day the weather was completely different a cool, clear, but windy 20 degrees. Shalunov now with his issue resolved, would again start at the back of the grid. Freer who has set a pole time in tough conditions the previous day was called away to work, so the whole grid bumped up one place leaving Sean Simpson on the pole. The race got underway and Shalunov had a point to prove, going to the outside he took a risk on the dusty part of the track to overtake making his way to the lead. Amazingly he was in the lead by the end of lap 1 but being chased by Sean Simpson. Matching each other for a few laps in the mid 1m27s’s, Sergey reacted with a couple of 1m25’s to put some fresh air between them. Meanwhile James Edmeades, Ian Roberts latched onto the back of Simpson and the three were covered by less than a second up until the mid race pitstops. Ian pitted as soon as the window opened to allow him to re enter the track in free air, while Edmeads hung on to the last moment before coming in to hand the car over the his team mate Jeff Curtis. Meanwhile Shalunov had pitted, and re entered the track with a clear lead out front. As the timesheets started to settle after all the pit stops it was Shalunov from Smith followed by Simpson in third, but with charging Roberts (who had a 15 sec pit penally from his race 1 win) was close behind. However on lap 18, Roberts lost control of the car while chasing down Smith. The race finished with Shalunov taking a perfect start to finish win, followed by Sam North/Hugh Smith and Sean Simpson in third. However it was not quite over! During the race, race control had indicated that two cars were under investigation for pit lane speeding infringements and race winner Shalunov was under investigation for running off track at the start of the race. The podium went ahead, but with a slightly tighter grip on the trophies than normal given the impeding decisions from the stewards. In the end both pit lane infringements were overturned, due to inaccurate radar readings, so no further action taken. However, Shalunov was given a 10 penalty for gaining an advantage at the start of the race. But with the large lead that he had built up in the race he managed to hold onto his well deserved win! Finally the Smith/North car was also reported to the stewards for being 5kg under the minimum weight at the end of the race, but luckily for them they had also performed brilliantly in the race and just held onto their second place after also being handed a 10 second penalty. 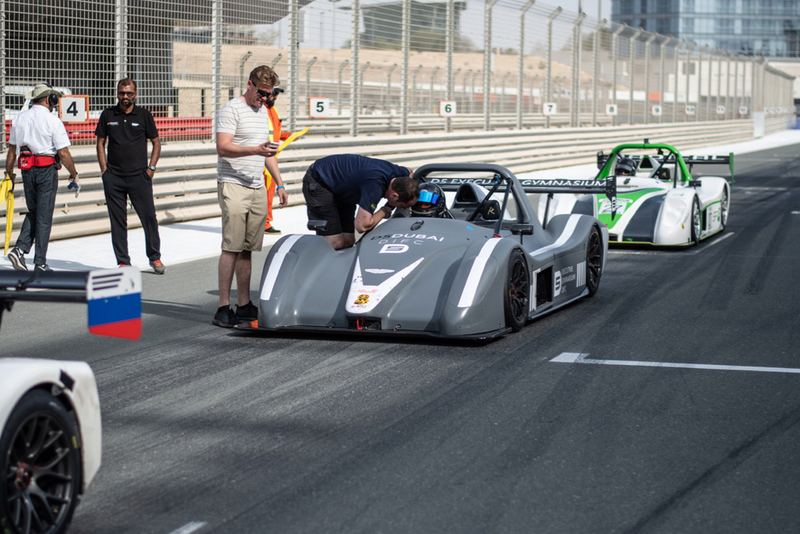 The final round takes place at the Dubai Autodrome on the 22nd of March where the crown will be decided! 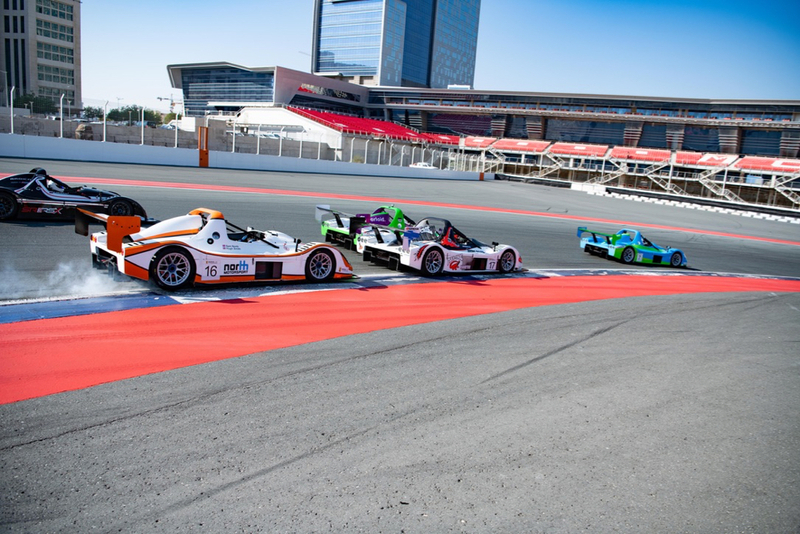 Victory for British and Australian Drivers in Gulf Radical Cup. The D5 Racing pairing of Jeff Curtis and James Edmeades took victory in a spectacular race that saw Vice Champion Sergey Shalanov retire on lap 3 with a technical issue and pole sitter Ian Roberts lose the lead on the penultimate lap. With the customary sportscar rolling start Roberts took full advantage of his P1 grid position to hold the lead into turn 1 from Hjerrpe and Shalanov, then maintained his advantage whilst watching his competitors jockeying for position in his mirrors. On lap 19 the drivers started to come into the pits for their mandatory pit stop, the result of which Roberts increased his lead. But in the second half of the race it was a now a newcomer to the series, the experienced Australian racer Yasser Shahin who started to get much larger in those small, vibrating mirrors! Both cars arrived nose to tail into the last corner of the penultimate lap but it was Shahin came through first, albeit slowing with body damage after making contact with Roberts. But as both cars scrambled to recover they were caught by the number 17 car driven by Aalerud and the number 4 car now being driven by James Edmeades. As Shahin tried to drive his broken car he inadvertently blocked Robert’s path to Turn 1 and it was Edmeades at the back of the group that found the best line past the other three cars to take the lead which he held to the finish and victory! The fastest lap of the race, 56.089 was set by South African driver Sean Simpson who shared with series returnee, Pakistan’s Usmaan Mughal to finish 4th. 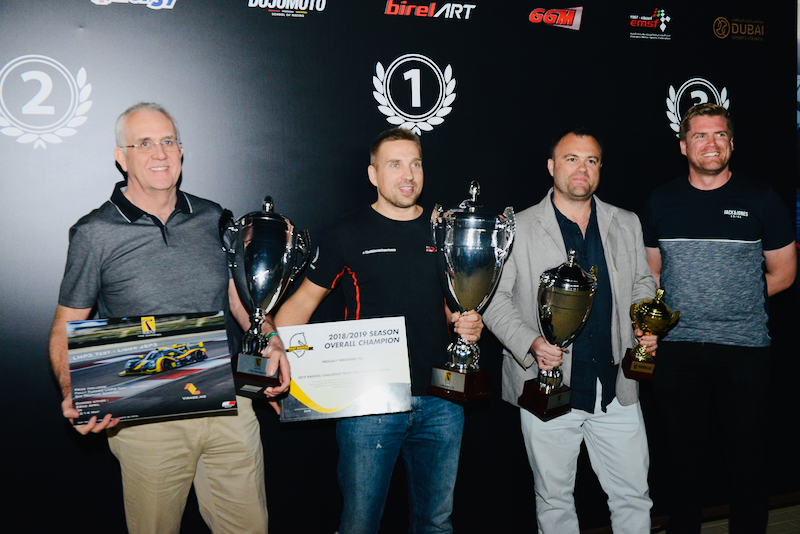 Trophies were presented by two-times 24Hours of Le Mans Winner, Tommy Erdos, who works with series organiser GulfSport Racing as their driver’s coach. After a stewards enquiry Shahin was handed a 3 place grid penalty for his contact with Roberts that ultimately lost Roberts his first win of the season. Round 8 got off to an even more frenetic start with cars going 4 wide into turn 1 under the bright F1 lights. James Edmeades and Sergey Shalunov were on the front row and fought tooth and nail to command the race. But a mistake by Shalunov under braking meant that both car’s lost their advantage which allowed Yasser Shahin to take the lead which he held to the chequered flag. Ian Roberts was in second place followed by Jani Hjerppe, Hugh Smith, Shalunov, Feyzullin and Edmeades. This was one very fast train with the first 6 cars circulating on almost identical lap times separated by less than 4 seconds! The train shortened momentarily as Roberts spun across the damp grass at the last turn putting himself at the back of the train. Yet again the mandatory pitstops changed things around with Shahin now closely followed by Shalunov and Aalerud. But Shalunov would lose his place due to a drive through penalty for the incident with Edmeades, and Mughal made his move up to 3rd place - an amazing performance from someone who last race a Radical some 8 years ago! So at the finish it was Shahin, Aalerud and Mughal on the podium with Shalunov in 4th setting the fastest lap in the process. 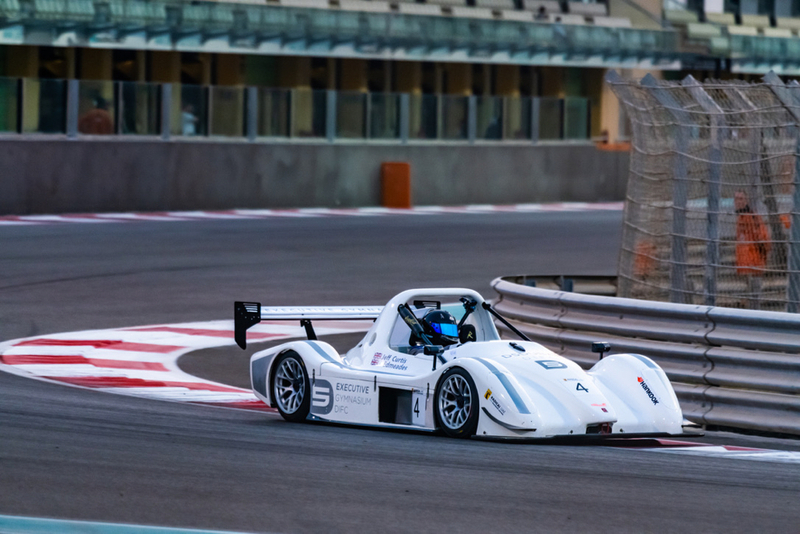 This weekend sees 11 amateur racing drivers competing in Rounds 5 & 6 of the Gulf Radical Cup which is being held on the fabulous 4.33 kms International Circuit in Dubai. There are no cash prizes; just the glory and pride that comes from winning a trophy. 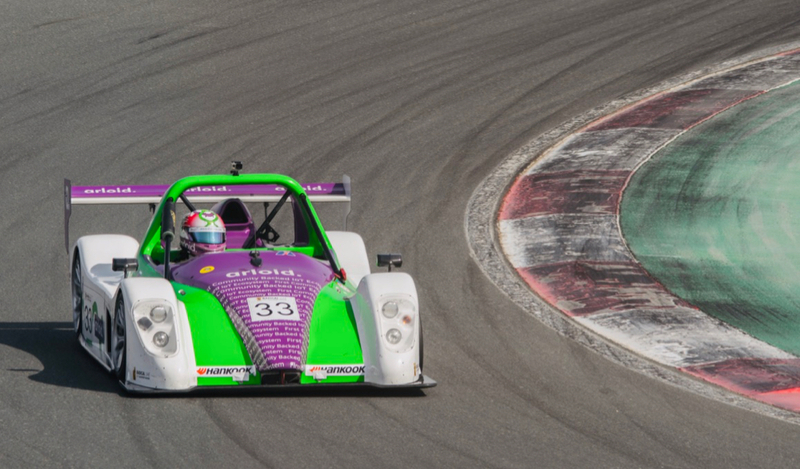 The circuit layout being used has 10 challenging corners, many of which demand major commitment as they produce more than 2G in their high downforce Radical SR3 production sports prototypes. Paddle shift, more than 10,000 rpm, unparalleled amounts of grip and stopping power - a very exciting experience. Nothing compares! As a two driver race there are two qualifying sessions, the first of which sees GulfSports Ian Roberts in the #7 car taking his first pole position in the series with a lap of 1:41.151 after a second GulfSport car, driven by Russian driver, Sergey Shalunov had his fastest time disallowed for exceeding track limits. In the second qualifying Sergey was not to be out down, and while waiting in the pits rolls out with just three minuets to go after seeing his team mate Roberts post another pole time. Shalunov then put in a blistering 1:40.176 to take pole! So all eyes were on Roberts for Round 5 as they started with Shalunov in P2 and series leader Jane Hjerppe (Dream Racing) in the #17 uncharacteristically back in P3. After the mandatory 45-second pit stop where time penalties are added based on the result of the previous race we find Shalunov and Roberts fighting it out for the lead with Hjerppe still in 3rd being harassed by the hard charging James Edmeades of D5 Racing in the #4 who sets the fastest lap of the race in the process. Roberts has a spin passing back markers on the penultimate lap but manages to stay ahead of Hjerppe to finish second behind Shalunov. Round 6 saw Shalunov on pole but very much aware that he would have a 15 second time penalty on his pit stop as a result of his win in the previous race, some 10 seconds more than Hjerppe. At the start it was Roberts who took the initial lead but both the front row starters were out dragged by fast starting Hjerppe whose actions caused the officials to take a close look. However, they decided it was ok and no penalty was given. On lap 3 Roberts retired with a broken drive shaft, leaving Hjerppe in the lead very closely followed by Shalunov and James Edmeades in the #4, all nose to tail. First to take their pitstop was the Sam North / Hugh Smith combo in the #16 followed a lap later by South African racer Sean Simpson in the #26. Two laps later and the freight train of Shalunov, Hjerppe and James Edmeades, who again set fastest lap, came storming in together. Based on their time penalties, Hjeppe got back on track first followed shortly by Edmeades’ partner Jeff Curtis - but previous race winner Shalunov was retired by his team in the pit stop with a ruptured oil line after it having being pointed out by the D5 driver on exiting his car. The second half of the race saw a very close battle between Hjerppe and Simpson who were never less than a second apart on track until on lap 22 Simpson finally took the lead - only to be penalised with a Stop/Go penalty for speeding in the pit lane! He clearly was enjoying his race, the first time he had led a Radical race and clearly decided he would continue despite receiving a 20 penalty for his misdemeanour which given that Curtis was now some 30 seconds back still gave him second place. Amir Feyzulin (AUH) finished a strong 5th ahead of the Sam North and Hugh Smith due who had an enjoyable event finishing both races ahead of Fran Cush and Neil Clark. Rounds 7 & 8 will take place at the Yas Marina Circuit on the 18th January. Following on from Konstantin Gugkaev’s victory the previous day, Round 4 of the 2018 Gulf Radical Cup offered drivers their second opportunity of the weekend to score valuable points in the championship. The race kicked off from a rolling start with poleman Gugkaev taking the lead followed by D5’s James Edmeads, Sergey Shalunov and Seppo Mantyla in close pursuit. But by the end of lap 1, Shalunov had got past Edmeads. As the drivers started to burn off their heavy fuel load and settle into a fast pace it was noticeable that on lap 4 the first four cars were lapping within .13 of a second - remarkably consistent and close racing! But on lap 6, the hard charging Shalunov spun which cost him time and put him at the back of the pack with a lot of work to do to catch back up. Just a couple of fast laps later he was already past compatriot Amir Feyzulin. After 15 minutes the pit lane was opened for the mandatory pit stop window of 10 minutes when drivers must stop their car for 45 seconds. The top 3 from the previous race have to also observe an additional pit stop penalty which can have quite a dramatic impact on the race order. First to pit was Gugkaev, Mantyla and Ian Roberts followed the next lap by Ben Freer and Shalunov. James Edmeads brought the #4 car in just moments before the pit lane closed but was reported for speeding in the pit lane. As the race resumed with all the pit stops completed, it was Jeff Curtis in the #4 who was in the lead, followed by Gugkaev some 8.5 seconds behind and Jani Hjerppe in the #17 just 1.2 seconds adrift. Within 3 laps Hjerppe had got past Gugkaev and would go on to overtake Curtis to take the lead. But at the rear of the pack Shalunov, who had been driving rapidly, just posting a purple first sector to regain his position suffered a technical issue which stopped the car in a difficult spot and which brought out the safety car. The order did not change as the race finished under the safety car giving victory to the team of Jani Hjerppe and Seppo Mantyla, with James Edmeades and Jeff Curtis in second and Gugkaev in third. 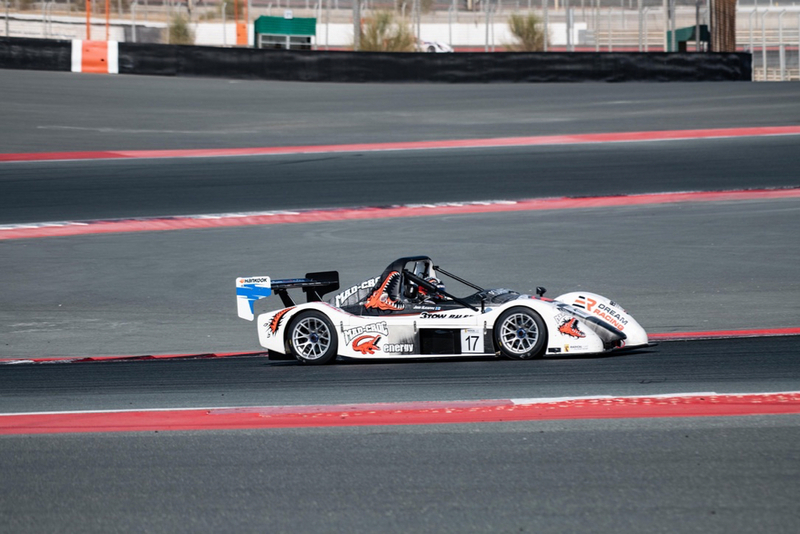 Rounds 5 and 6 of the Gulf Radical Cup will be held on the 7th & 8th December at the Dubai Autodrome. The Gulf Radical Cup is promoted by GulfSport Racing, the UAE’s exclusive sales and support centre for Radical customers. 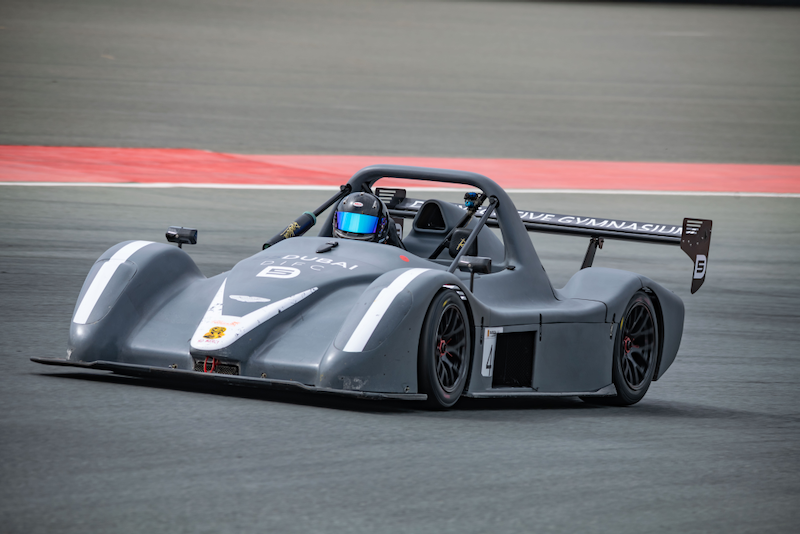 After a couple of stunning races at the season opener on the Yas Marina Circuit last month, the UAE’s top national circuit race event, the Gulf Radical Cup moved to Dubai for Rounds 3 and 4 of this 12 round championship for drivers of the world’s best selling production sports prototype, the Radical SR3. Featuring drivers from Australia, Finland, Russia and Great Britain, including the 2017 European Masters Champion, Jani Hjerppe, these rounds are taking place on the magnificent 5.4kms Grand Prix Circuit. Round 3 got off to a cracking start with the Finish Champion taking an immediate lead in the number 17 Radical SR3 followed closely by Russian driver Sergey Shalunov in the number 33 car. But on that opening lap it was British driver Ian Roberts who managed to slip by to take second place which he was to hold for the first 4 laps. On lap 5 Shalunov managed to regain 2nd place from Roberts, who then came under pressure from another Russian driver, Konstantin Gugkaev in the number 9 car who got by Roberts on lap 9 to move up to 3rd place. The Gulf Radical Cup features 45 minute races with a mandatory pit stop. To make things interesting, previous success attracts a pit stop time penalty, so Hjerppe had an extra 15 seconds and Shalunov had an extra 10 seconds based on them coming 1st and second respectively in Round 2. 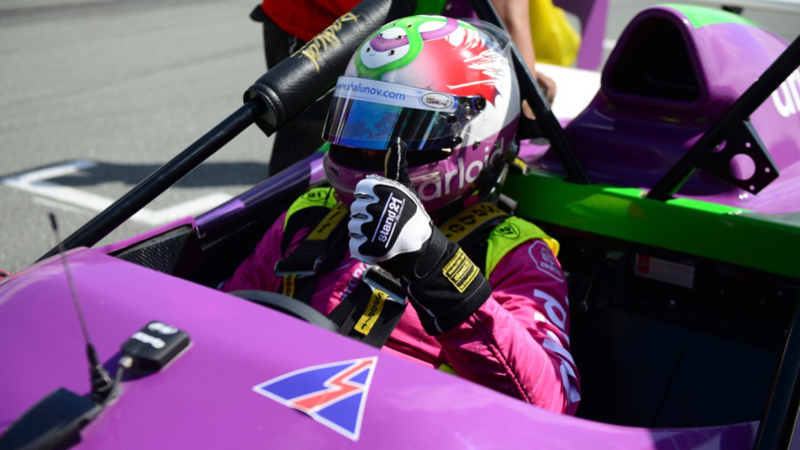 This offered Gugkaev an advantage which he used to the full to take the lead after the pitstops which he never relinquished to take his first victory in the championship. But all eyes were on Hjerppe’s driving partner Seppo Mantyla who emerged from the pitstops just a couple of seconds ahead of Shalunov who set about getting past him over the course of the second half of the race. But try as he might, with the gap reducing to just 0.3 of a second, Shalunov was unable to get by and decided to stay safely in 3rd place to the finish even though he set the fastest lap of the race in the process. Roberts was only 1.5 seconds adrift at the finish, a very creditable drive from this newcomer and was followed home by the experienced British duo of James Edmeades and Jeff Curtis, and Russian driver Amir Feyzulin. The Australian driver Ben Freer suffered an unfortunate puncture on lap 2 which put pay to his chances of points. However, they all get another chance to shine on the awesome GP Circuit tomorrow afternoon when they line up for Round 4. 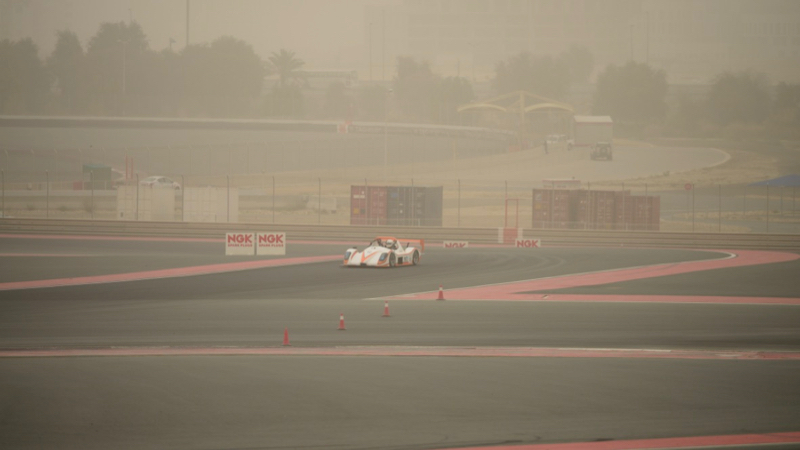 The second round of the 2018/19 Gulf Radical Cup was challenging from both the perspective of plus 50C track surface temperatures and close competition. 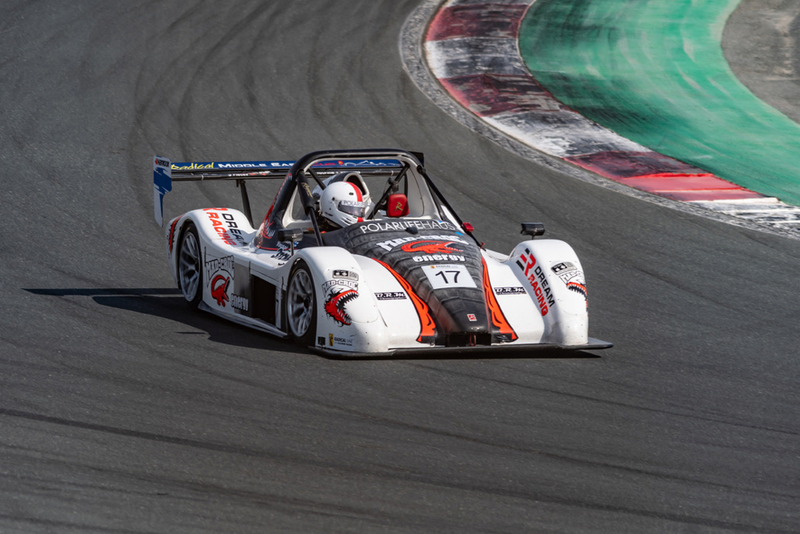 Six local race teams had entered 17 drivers who would be driving identical 240bhp Radical SR3s running on Hankook slicks, a very good start to the new season. 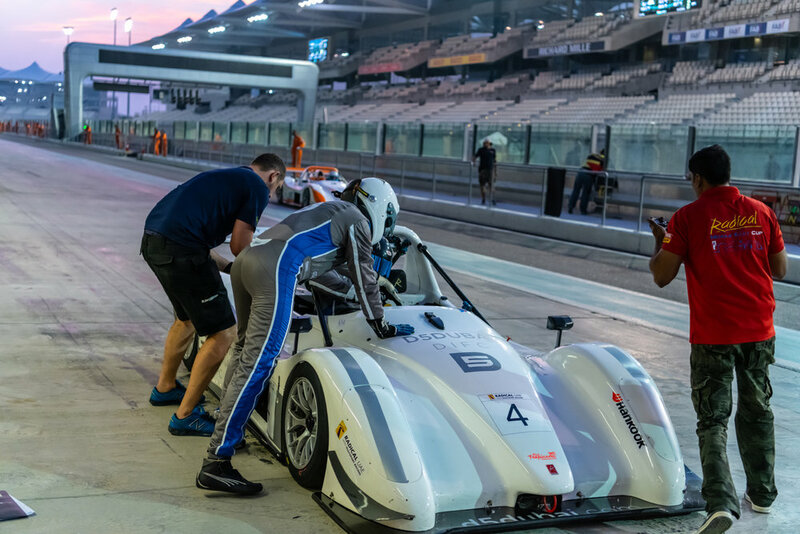 The combination of Yas Marina Circuit instructor Shibin Yousaf and Finish racer Jani Hjerppe (Dream Racing) proved unbeatable again - but only just! Russian driver Sergey Shalunov had a great race strategy courtesy of his Team GulfSport’s two time LeMans winning driver coach Tommy Erdos which saw Shalunov take and hold the lead after his pit stop, exiting the pits just ahead of his team mate Ian Roberts. Unfortunately Shalunov found himself inexplicably in neutral coming onto the back straight on the very last lap of the race which allowed Hjerppe to take the lead and win the race. Hjerppe admitted to Shalunov that without that mistake he would not have been able to get past. South African driver Sean Simpson had a very strong run to take a creditable 3rd place for Dream Racing with Ian Roberts (Team GulfSport) overtaking two competitors to finish 4th. The race was action packed as ex-motorcycle racer James Edmeads (D5 Racing with AUH) got through Turn 1 ahead of the pack, but it was the experienced Tarek El Gammel who came round to lead the first lap and opened up a sizeable lead going into the pit stop to hand over to Hamdan Al Ghaferi (Dream Racing). After taking over from Edmeades, Jeff Curtis would go on to finish in 5th place ahead of Al Ghaferi and Elgammal. Konstantin Tatulov (B Tuning with AUH) and Amir Feyzullin (AUH) came in 8th and 9th respectively with rookie drivers Neal Clark and Fran Cush (Team GulfSport) having a very successful first event by completing both races as they got to grips with driving a Radical SR3 on a very difficult 5,555 metre long GP circuit with 21 corners! Mikhail Stepanov (B Tuning with AUH) retired his car after 9 laps and Dragos Dumitrascu (AUH) was a non-starter due to damage sustained in a high speed failure in qualifying. Rounds 3 & 4 will take place at the Dubai Autodrome on 16th November. 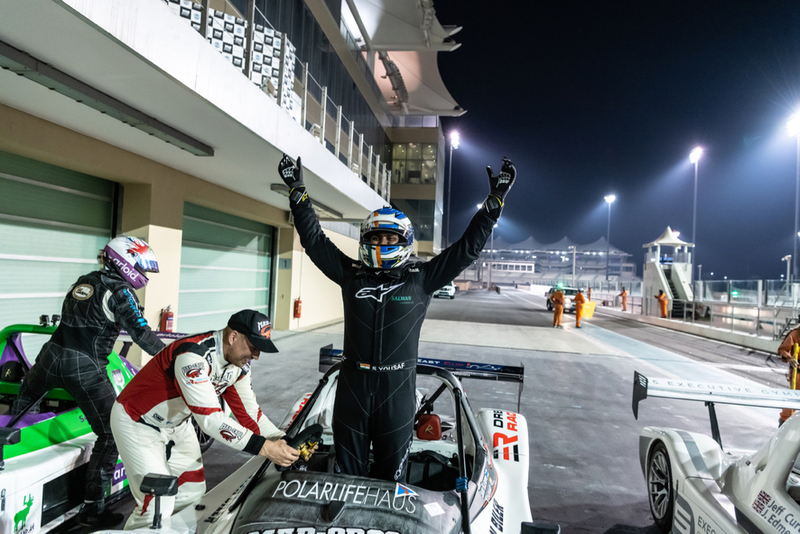 The 2018/19 Gulf Radical Cup got off to a flying start under lights on Abu Dhabi’s 5.5kms F1 Grand Prix Circuit this evening with a win for pole sitter Jani Hjerppe and Shibin Yousaf, who took over the #17 car during the mandatory 45 second pit stop. However, they were pushed hard all through the race by Sergey Shalunov who finished just three quarters of a second behind Yousaf after racing hard for 95kms in the 35C dusk conditions. There were significant challenges for some of the 13 drivers who got caught out by a safety car period that was called when Sean Simpson spun the # 26 car on oil as he entered the pit lane for his mandatory pit stop. The leading quartet, who had not yet pitted took full advantage of the safety car period to dive in with the east loss of time. In the second half of the race it was the extremely quick D5 Racing James Edmeades who worked his way through to an impressive 3rd place in the #4 car he was sharing with Jeff Curtis. Dream Racings Tarek El Gammel, who was sharing with Hamdan Al Ghaferi set the fastest lap time of the day in the #75 car with a 2:16.882 on the last lap! 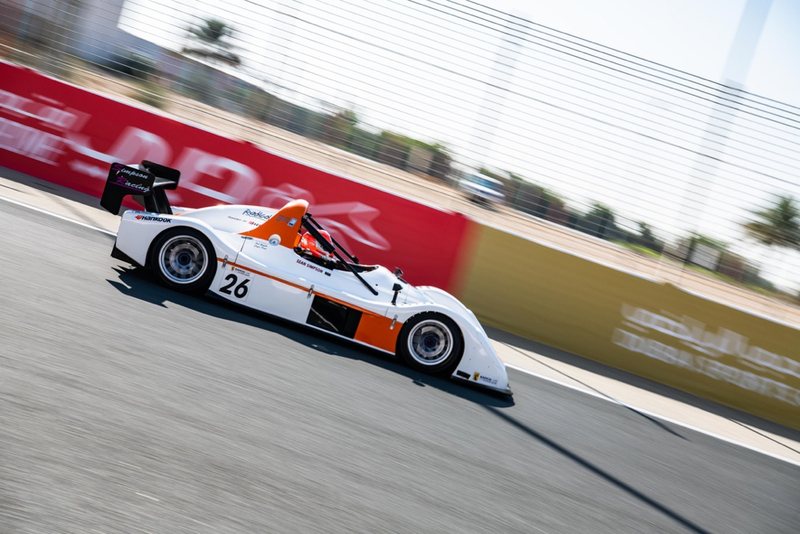 The Gulf Radical Cup is organised and promoted by GulfSport Racing who have been providing a full customer sales and support role for teams and drivers in the region since 2004. Round 2 takes place on Saturday 29th October. 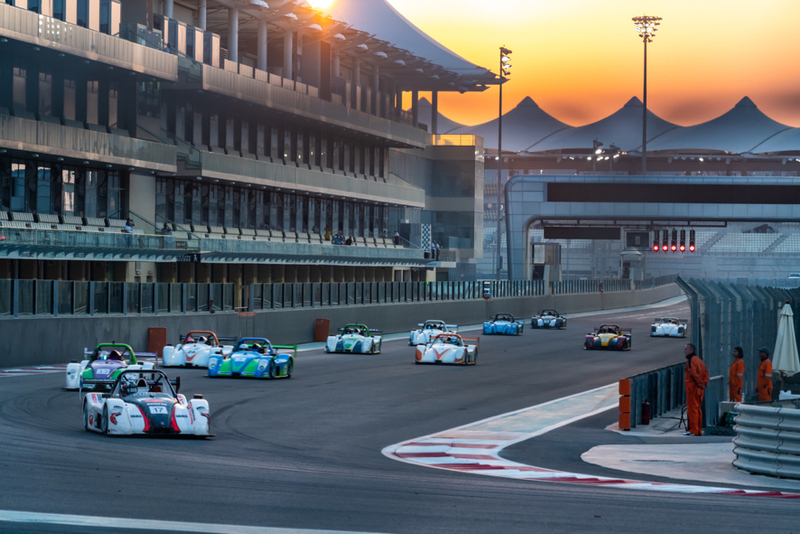 As the weather cools down, the action heats up and the lights come on at the Yas Marina F1 Circuit when a combined 3,000 bhp of high-revving, tyre shredding, slicks and wings sports racing cars leave the grid on Friday evening for the first round of the Gulf Radical Cup. 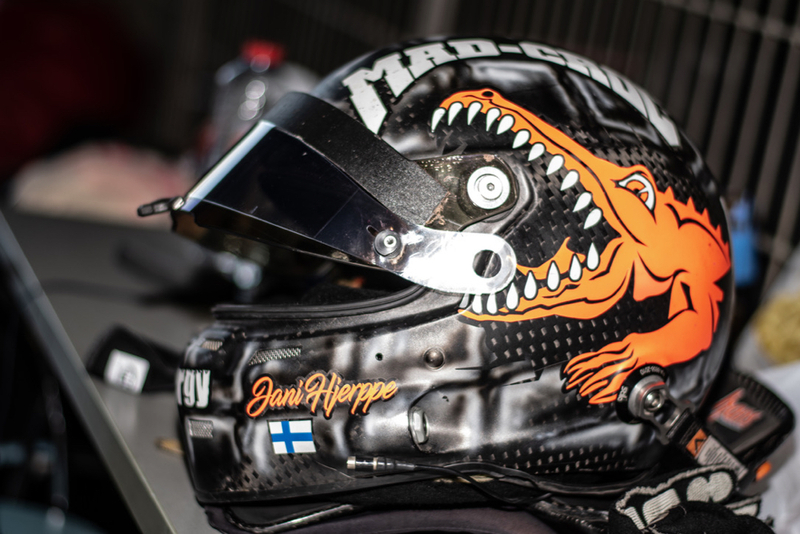 Following Kimi Raikkonen’s popular victory in Texas last weekend, Finish compatriot and experienced Radical racer Jani Hjerppe will be highly motivated to win on the same circuit that will host the final F1 showdown in exactly one month. However, he may not have it all his own way as there are some quick competitors signed up who will also be eyeing that top step of the famous Yas podium. British drivers Jeff Curtis and James Edmeades who will be sharing the Number 4 car, and Ian Roberts in the Number 7 car will be trying their hardest to stop Hjerppe from taking the large trophies. 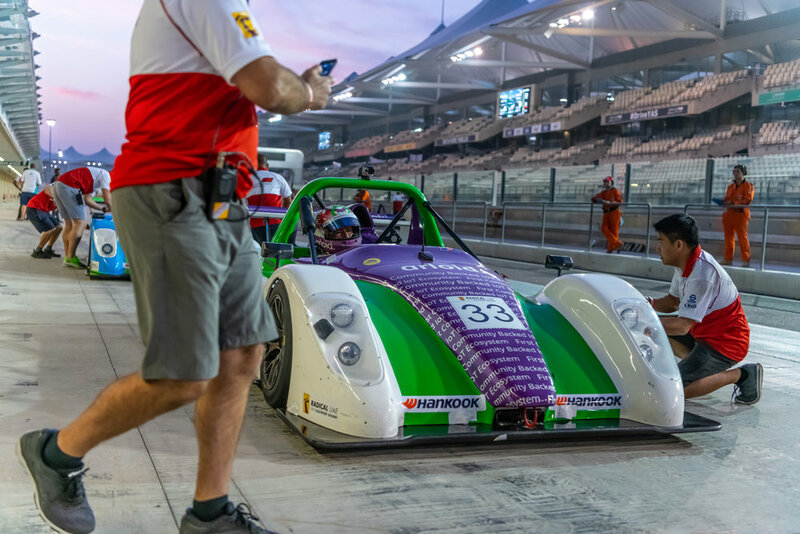 Russia is well represented by Sergey Shalunov in the number 33 car, Amir Feyzullin in the number 15, Konstantin Tatulov in the number 35, and Mikhail Stepanov in the number 83. Just to complete the international lineup Australian racer Ben Freer makes his debut in the number 27, South African single seater specialist Sean Simpson will also make his debut in the number 26 and Dragos Dumitrascu will be representing Romania in the number 25. Also making their race debut are the UK’s Fran Cush and Neil Clark in the number 55. Terry Fleet and Wesley Fongenie will be sharing the number 12 and Sam North and Hugh Smith will be driving the number 16. 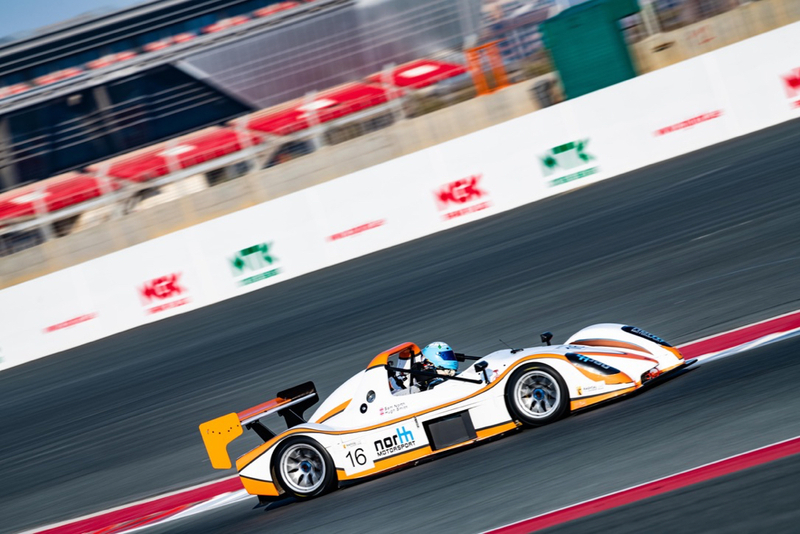 The Gulf Radical Cup (www.gulfradicalcup.com) which was first run at the Dubai Autodrome in 2006 is a single manufacturer series featuring the 226bhp / 240kph Radical SR3 running on Hankook slick racing tyres. The event allows for two drivers to share a car with a mandatory pit stop halfway through their two 45 minute races to change driver. 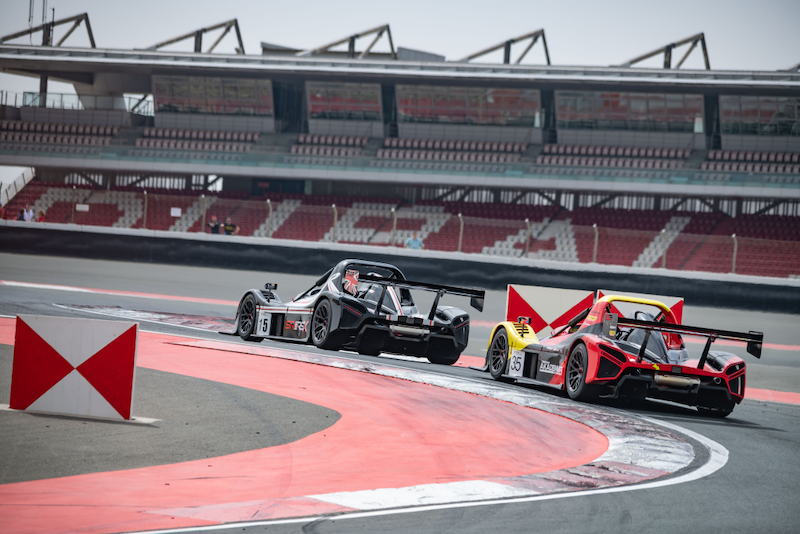 This same format of Radical endurance racing takes place in Europe, the Americas, Australasia, the Middle East and Asia enabling Radical’s customers to transfer their race experience around the world. 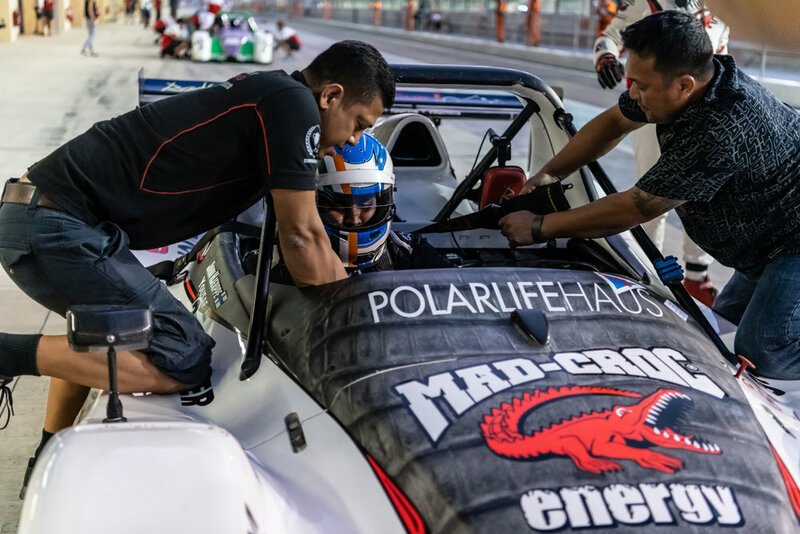 The Gulf Radical Cup event is open to Race License Holders and is organised by GulfSport Racing who provide full support services to Radical customers in the UAE.